This four-poster Queen-sized bed features the Garden View with its own private bath. 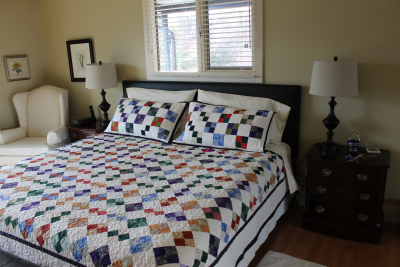 Hand-made quilts, robes, slippers, extra blankets and spa amenities included. Color TV, cable, Netflix, WiFi included in the room. - $140/night includes: full breakfast, all taxes. We are sorry, apparently there is no room pricing available. Enjoy our private deck with beautiful views of Okanagan Lake and valley. Large private bathroom with soaker tub and separate walk-in shower. 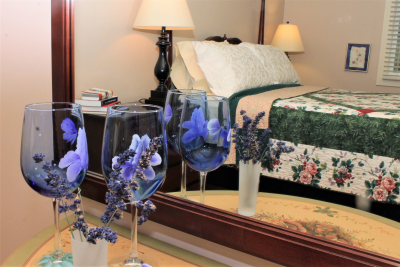 Hand-made quilts, bathrobes and slippers, spa amenities are all provided. Large closet and drawer space available. Mirrored closet doors. - $160/night includes: full breakfast, all taxes.